For years, immunotherapy drugs have impressed researchers, doctors, and patients with their ability to target cancer cells with less severe side effects than other treatments. Many types of drugs are being developed, including several for mesothelioma. Just last month, results from a trial testing CRS-207 showed that the immunotherapy drug controlled the disease for 94% of participating mesothelioma patients. Earlier this year, Vice President Joe Biden began the “Cancer Moonshot Initiative” as a challenge to the United States to invest more time, money, and effort into finding cancer cures. “We’re calling it a ‘Moonshot,’ and that’s because I believe that this effort, like President Kennedy’s call to land on the moon 55 years ago, is truly a call to humankind — to be bold and do big things,” Vice President Joe Biden said in a message on the White House website. The moonshot initiative has already helped to catalyze the research and development of new immunotherapy drugs. Since then, several cancer centers have accepted the challenge by dedicating new institutes to finding and testing new immunotherapy treatments. 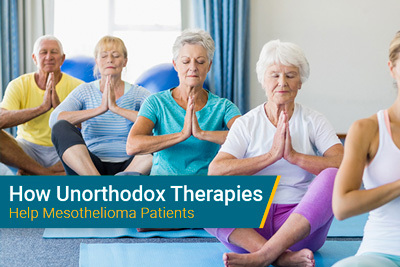 Many of the cancer centers involved are also top mesothelioma treatment centers. John Hopkins Medicine accepted the challenge from the Vice President. In response to the call for a moonshot, John Hopkins Medicine announced The Bloomberg~Kimmel Institute for Cancer Immunotherapy, a new program specifically dedicated to studying and implementing cancer immunotherapies. The Bloomberg~Kimmel Institute for Cancer Immunotherapy is being made possible through 125 million dollars in donations. Much of the money for the institute was donated by Michael Bloomberg, former mayor of New York City. Another large contributor was Sidney Kimmel, a long-time supporter of John Hopkins Medicine whom their cancer center is named after. Sean Parker is an entrepreneur known for co-founding Napster and helping to create Facebook. After the moonshot was announced, The Parker Foundation, his philanthropy organization, committed $250 million to form the Parker Institute for Cancer Immunotherapy. The Parker Institute is a collaboration between six of the top cancer centers around the country, including the first to join: Memorial Sloan Kettering. Through teamwork, doctors and researchers hope that immunotherapy can develop at a quicker rate than when the cancer centers felt that they were competing. Memorial Sloan Kettering Cancer Center, Stanford University, UCLA, UCSF, the University of Texas MD Anderson Cancer Center, and the University of Pennsylvania are all working together through the Parker Institute. These top cancer centers can now share their data and ideas and collaborate on research and clinical trials. Bloomberg~Kimmel Institute for Cancer Immunotherapy. John Hopkins Medicine. Retrieved from: http://www.hopkinsmedicine.org/kimmel_cancer_center/news_events/immunotherapy_institute/. Accessed: 05/17/16. 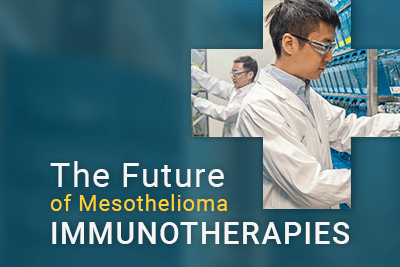 Novel Vaccine Added to Chemotherapy Improves Patient Outcomes in Mesothelioma - See more at: http://global.onclive.com/conference-coverage/ELCC-2016/novel-vaccine-added-to-chemotherapy-improves-patient-outcomes-in-mesothelioma#sthash.WeCl1KmM.dpuf. OncLive. Retrieved from: http://global.onclive.com/conference-coverage/ELCC-2016/novel-vaccine-added-to-chemotherapy-improves-patient-outcomes-in-mesothelioma. Accessed: 05/17/16. The Parker Institute for Cancer Immunotherapy. The Parker Foundation. Retrieved from: http://parker.org/initiatives/the-parker-institute-for-cancer-immunotherapy. Accessed: 05/17/16. About. The Parker Foundation. Retrieved from: http://parker.org/about. Accessed: 05/17/16. The First Meeting of the Cancer Moonshot Task Force. The White House. Retrieved from: https://www.whitehouse.gov/blog/2016/02/01/first-meeting-cancer-moonshot-task-force. Accessed: 05/17/16.